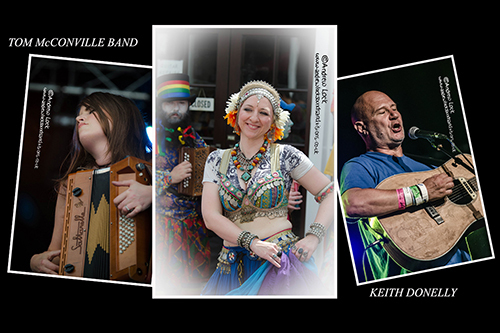 The Warwick Folk Festival has come around again and I paid a couple of visits this year to take in some of the folk sounds. With perfect timing ! the weather broke for the opening Thursday evening with rain falling fairly steady for the whole night. The Main Stage (at the Warwick School main festival site) was my target for the opening evening and I made it early as really wanted to see Warwick Folk Festival regular Keith Donnelly in action as usual combining hilarious stories and anecdotes with his clever and also humorous songs. Following Keith it was the banjos, guitars and vocals of folk duo Jimmy Aldridge and Sid Goldsmith who coped really well with the loss of stage power towards the end of the set by (with the help of the audience) performing completely unplugged. Headliners The Unthanks must rate amongst the more original sounding artists I have had the pleasure of seeing perform, with what looked like a 10 piece band on stage (including violin and trumpet) sisters Rachel and Becky Unthank mixed folk, Celtic (dash of Enya, Clannad possibly), ambient and cinematic sounds and even a touch of prog rock at times with a little clog dancing. With the dramatic lighting adding to the atmosphere this was a set to remember. Saturday was a lunchtime walk down Smith Street to photograph a a bit of Morris Dancing and the Belly Dancers before heading to Warwick school to see what was going on. First up but unfortunately only for their last number was The Unsung Roots on the main outdoor stage, a young duo with fine harmonies and superb violin and banjo work. Also caught the afternoon Main stage action which consisted of the folk/jazz sounds of Steamchicken, a lively set by the Tom McConville Band (what a fiddle player Tom is and what a character to boot) and a at times rocking, Celtic influenced set by Jamie Smith’s Mabon. Well that was this year for me and also enjoyed checking out some of the spontaneous musical goings on around the superb Beer and Cider area.